Back at the beginning of January, Sarah Beth of Sarah Beth Yoga had a 7-day yoga challenge. I joined in and enjoyed it very much. Then I pulled something in my side (from coughing, not from yoga) and movement of any kind became painful. So I took a few days off, but I picked up with my good intentions soon after. I'm happy to say that if I stay on track, I will have completed anywhere from 10-60 minutes of yoga on 27 out of 31 days in the month of January. This got me thinking about The Happiness Project. I read it a few years ago (as most of us probably did) and I really admired Gretchen's goal-setting mentality. Giving yourself something to work toward is important. So I'm going to come up with a new goal each month and do my best to follow through. This is in addition to my overriding goal of "new recipe each Monday" (that thing I still think I'm going to do, remember?). Also, some of the goals can carry over from month to month. There's no reason why I can't practice yoga every day in February too. Honestly, it makes me feel so good that I'd be doing myself a disservice if I quit now. So. 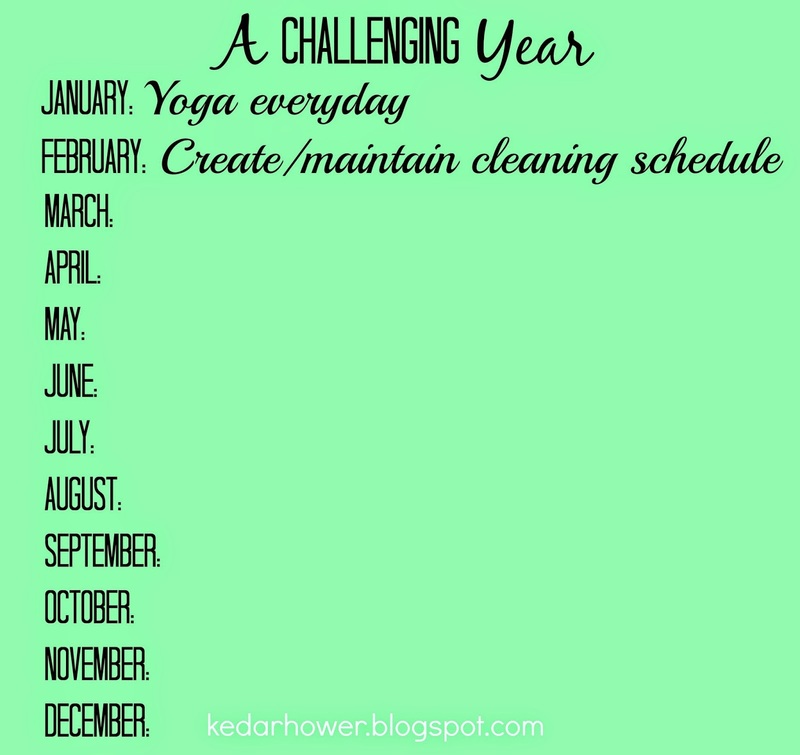 February's challenge will be to come up with a cleaning schedule, put it into practice and stick to it. This may take some doing. I'm generally an all or nothing type of person, and I'm having trouble with the logistics. When you're remodeling, you're continuously cleaning and it can lead to Saturdays being absolutely exhausting. By Sunday afternoon, I'm spent and don't even want to cook dinner, lest I dirty more dishes. Also, I have some concerns: So wash linens is Saturday, but what if I'm out of town? Or if I write grocery shop for Saturday, what if I can't make it to the store until Sunday? Dust on a Wednesday? What if the only thing I want to do on Wednesday is drink moscato and watch reruns? Actually, I'm more likely to have my act together by Wednesday, so I think Monday and Tuesday will have to be the "light" days on this schedule. Any advice on where to start? 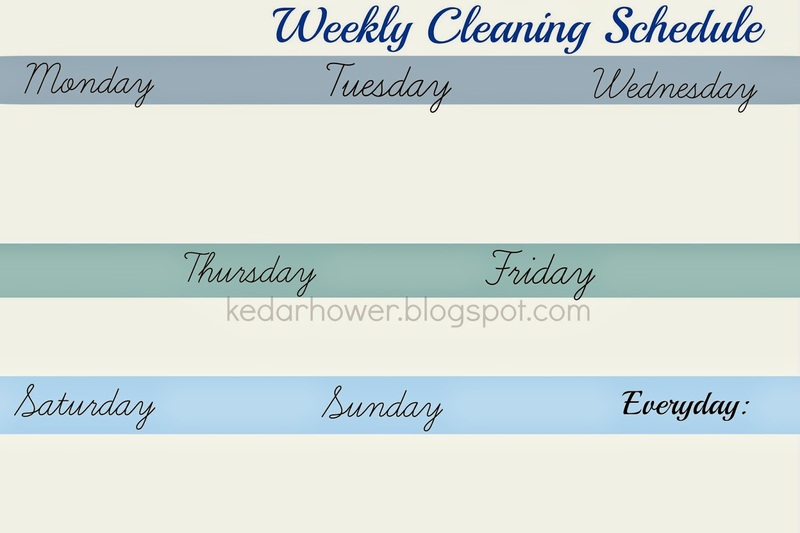 Do you use a cleaning schedule? As you may imagine, I do use one. I can email it to you if you like. I alter it based on season/times of busy-ness. Oh I need to do this! The house just gets awful during the week and I have to reset on the weekends, when I have time, but I would love to be able to do one thing each day and keep it up all week! I think there are a bunch of cleaning schedules on Pinterest. You could check there! I have tried to create a cleaning schedule but I usually end up doing everything on Mondays haha. I've been getting back into yoga quite a bit lately, too. I always forget how much I love it when I stop doing it, and then I wonder why I ever stopped. That thick yoga mat I ordered has made so much difference, too. I really, really, really need to create a cleaning schedule. I don't like being that person that forgets to do things like dust or clean the bathtub until they start to actually look dirty. i have wanted to do this for ages... but like you, i'm an all or nothing person. i clean the whole house top to bottom like once every two weeks - it takes so much time and i know i wouldn't need to do it as often if i did certain things throughout the week. you'll have to share how you come along! I tried to have a cleaning schedule back when I was running my pioneer projects. It fell apart after a few weeks because I have a stick-to-it problem. As in, I don't. So, if you have any secrets about how you're sticking to it, please share them. I love that you're building your habits one month at a time. The Happiness Project definitely showed why that's a good thing to do. I need to read that book again. What's a cleaning schedule?!?!?!?! ;) Seriously though I tried once and failed miserably at one so I don't do them anymore. I completely agree that it's important to always be working towards something! Goes kind of hand in hand with my whole 'Better you' thing! I love that you kept up with the yoga! I'm 3 miles away from my 40 miles in January (which, by the way, was a completely stupid goal and I'm regretting it hah). But at least I could do it, I started the year strong, and now I'd like to challenge myself to something different (like yoga--yoga could be good for me). It's also on my todo for a cleaning list--maybe we can brainstorm together.